In order to succeed in today’s very competitive online environment, you need to be able to stand out from the rest and not be like the average content marketers. Let me remind you though that it’s not going to be easy, it won’t be cheap and it won’t happen instantly. Research has shown that 90% of businesses in the world can leverage content marketing to take their online branding and influence to the next level. A poor marketer has only one thing in mind, endlessly share their news, press releases and what-not online via their social media profiles and other accounts online. But studies have shown that if you keep on doing this, you end up losing because your followers will stop listening altogether because they’ll soon get tired of hearing about you. To be considered valuable today, you need to add value to the conversation. Your focus should be more on creating conversations and engagements, and less about yourself. Give more thought and time on creating amazing content and increasing associations with influencers within your niche. Don’t expect others to share your content if you don’t do the same. So, a huge portion of your time should be spent sharing contents created by others – most especially influencers. How will you do this? 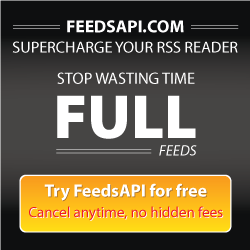 By using FeedsAPI’s full text RSS feeds to get the best content from influencers within your niche. If you are also able to get yourself on their radar by consistently following their blog and sharing their content, there’s a huge chance that they’ll mention you on their blogs too. What does this mean to you? The opportunity to be seen by their followers, and if you’re able to arouse the curiosity of these followers, possible leads for your own website. It may be hard to notice at first glance, but if you continually read blogs by others that are attracting a huge number of followers, you will have a clear understanding of the “tone” and the “type of audience” that these sites attract – which may just likely be your customer archetype. Remember that by doing great work, people will start to notice you, too. Just don’t expect that big-named influencers will notice you immediately. It’ll be wise to go after mid-level influencers first, and be bolder in your move as you get more noticed by them.